Helping Patients and Customers save Time, Money, and Stress at their local Pharmacy by addressing Common Pharmacy Related Questions! How should I store my medications? Why do I have no more refills? No more refills, can I get some pills for the weekend? Why is my refill too soon? My prescription is expensive, is there a generic of it? Dropped off my prescription weeks ago, why isn't it ready? Can I substitute my prescription with any OTC or natural products? Can I get my refill at the same chain pharmacy, but different location? What information is required on my prescription? I'm going on vacation, what about my medications? Didn't my doctor call It in/send it electronically already? How can I stay on top of my medications? Why Is My Prescription Not Covered By Insurance? Why is my Co-Pay so high? Do I have to pay my Co-Pay? Why Should I Talk To My Pharmacist? Why Should I Finish My Whole Bottle of Antibiotics Even When I Start To Feel Better? Why Should I Shop OTC Products? New Supplement On TV, Can You Tell Me More About It? Dissatisfied With My Pharmacy, What Should I Do? Love Your Pharmacy? Nominate Your Local Pharmacist Here! Share Your Worst or Weirdest Pharmacy Experience Here! Brand Vs. Generic, What's the Difference? 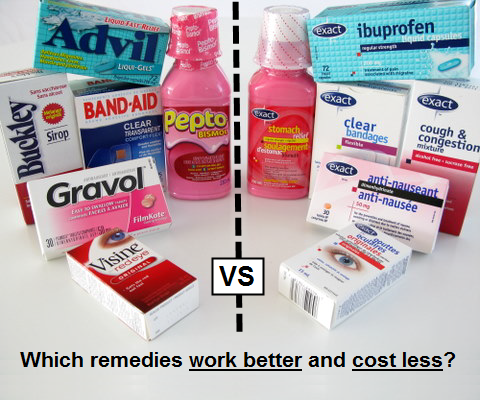 Essentially, there is NO DIFFERENCE in therapeutic effect between brand and generic. In order for a generic medication to be considered "generic," it must have the SAME amount of active pharmaceutical ingredients according to the FDA. Generics are much cheaper because multiple manufacturers can produce it as a result of a patent ending on Brand-name drugs. If you are shopping at your pharmacy, look at the back of the label under "Active Ingredient" to compare and see if a generic product is the same as it's brand-name counterpart. Many people still receive brand-name drugs simply because of preference or perhaps placebo effect where they believe brand-name drugs are more effective. In very rare instances, brand-name drugs may be better than generics for certain patients as there have been studies where certain patients responded better to a certain brand-name drug than its generic counterpart. Allergies to inactive ingredients such as coloring dyes may also contribute to these special cases where patients may need a brand over a generic medication. These are very rare instances and it goes to show what works for most people, sometimes won't work for some people. If you are looking to save money whether it is over-the-counter medications or on your prescriptions, generics will save you much more than brand-name in the long run. Also it is important to emphasize that the therapeutic effects are the same since generics contains the same amount of active pharmaceutical ingredients as Brand-name drugs. Feel free to post any comments, questions, feedback you may have about the website or Pharmacy in general.